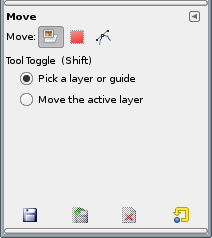 The Move Tool is used to move layers, selections, paths or guides. It works also on texts. By clicking the tool icon: . By using the keyboard shortcut M.
The Move tool is automatically activated when you create a guide. Keep in mind that your Move choice persists after quitting the tool. 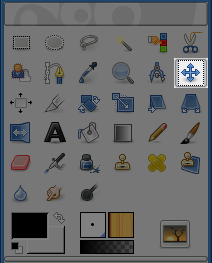 On an image with several layers, the mouse pointer turns to a crosshair when it goes over an element belonging to the current layer. Then you can click-and-drag it. If the mouse pointer has a small hand shape (showing that you do not pick an element of the active layer), you will move a non-active layer instead (it becomes the active layer while moving). If a guide exists on your image, it will turn to red when the mouse pointer goes over. Then it is activated and you can move it. Only the current layer will be moved. This may be useful if you want to move a layer with transparent areas, where you can easily pick the wrong layer. The selection's outline will be moved (see Section 2.1, “Moving a Selection”). That's the default option. The mouse pointer turns to a small hand when it goes over a visible path. Then you can move this path by click-and-dragging it (it will be the active path while moving). Only the current path will be moved. You can change the current path in the Path Dialog. The Move tool allows to move the selection outline only. If the Move Mode is “Layer”, you must hold down Ctrl+Alt keys. If the Move Mode is Selection, you can click-and-drag any point in canvas to move the selection outline. You can also use the arrow keys to move selections precisely. Then, holding down the Shift key moves then by increments of 25 pixels. When you move a selection with the Move tool, the center of the selection is marked with a small cross. This cross and selection boundaries snap to guides or grid if the View → Snap to Guides (or Grid) option is checked: this makes aligning selections easier. See Moving selections for other possibilities. The Move Mode must be “Layer”. Then you can choose between Move the Active Layer and, if you have one or more layers, Point to Layer (or Guide). If layers are grouped (with the little chain symbol) they will all move, regardless of which layer is currently active. The Path Tool dialog has its own moving function: see Section 6.2, “Paths”. But you can also use the Move Tool. The Move Mode must be set to “Path”. Note that the path becomes invisible; make it visible in the Path Dialog. You can choose the path to be moved or move the active path. Every text has its own layer and can be moved as layers. See Section 6.6, “Text”.